While your employer needs to take every reasonable step to ensure your safety, there is always a risk of an accident at work. trip over or slip on something that someone has left on the floor such as a length of cable, pieces of cardboard, oil/coolant even spilled tea; basically if you have an accident due to anything that shouldn’t be there then you are entitled to make a claim. be injured by machinery or equipment that is defective or broken. It may be that, to speed up productivity someone has removed the guards to a machine and you sustain an injury. It doesn’t have to be a machine or equipment that you work on. The law states that the need to supply safe, reliable equipment applies to all tools and equipment used in the process and this can include the chair that you site on which collapses, or even a coffee machine that burns you because it is not working properly. be injured as a result of the negligent actions or horseplay of a colleague or work-mate. Your employer may still be liable for the actions of someone you work with if the accident is caused by them not carrying out their job in the correct and proper manner. fall from a height. This is one of the most common and at the same time serious forms of accident. To be classed as a fall from height you don’t have to be on scaffolding or the top of a ladder; any job that takes you off the floor can be regarded as working at height and your employer must abide by the rules and regulations that cover this activity. injure your back lifting. Manual handling accidents often occur as a result of having to lift, move or carry something that is too heavy or awkward for you. It may be the case that you have not been supplied with appropriate equipment to assist you with lifting. It is your employer’s responsibility to properly assess your requirements and if you have an accident as a result of their failure to provide such equipment then you can claim for your injuries and losses. suffer injuries through a lack of proper protective clothing. Your employer is required to provide you with the right personal protective equipment for the job; if they don’t and you sustain an injury you can look to make a claim. suffer burns and discomfort as a result of splashing from chemicals or from inhaling fumes and other noxious substances. electric shock as a result of your employer’s failure to maintain equipment, failure to deal with mains issues or using an inherently dangerous system of work. 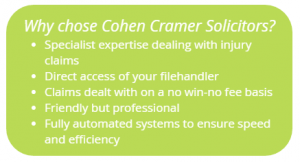 Cohen Cramer are experts at dealing with all forms of accidents at work and we can help you claim the compensation you deserve. We will claim compensation for your injuries and how much you will receive depends on how they have affected you and what, if any, long-term problems you are likely to have. We will obtain a medical report to make sure that we have all the information we need to ensure you get maximum compensation. Treatment costs such as physiotherapy and long term care if needed. Out of pocket expenses such as medication costs etc. All losses arising from and as a direct result of the accident. 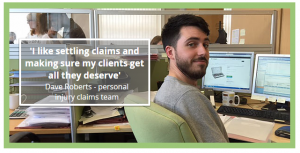 Your claim can be dealt with on a ‘No Win – No Fee’ basis, this means that if for any reason you are not successful then you don’t pay us a penny for the work we have done on your behalf. You have three years from the date of the accident, subject to the courts discretion to extend this period in exceptional circumstances to claim. However you don’t want to delay bringing a claim as witnesses can get forgetful, documents can be lost etc so to preserve your claim get in touch with us today.